My brain's kind of overactive, (as if you couldn't tell.) I like details, but I like simple details, if that makes any sense. As much as I love Ivan Reis and Ethan Van Sciver drawing insane splash pages with hundreds of Green Lantern corps members on them, it can get a little visually overwhelming and I can't seem to take it all in. Don't get me wrong, I appreciate the work it took to draw that kind of visual insanity, and I love looking at hundreds of Green Lanterns in the midst of interstellar battle, but sometimes your eye needs a little break. 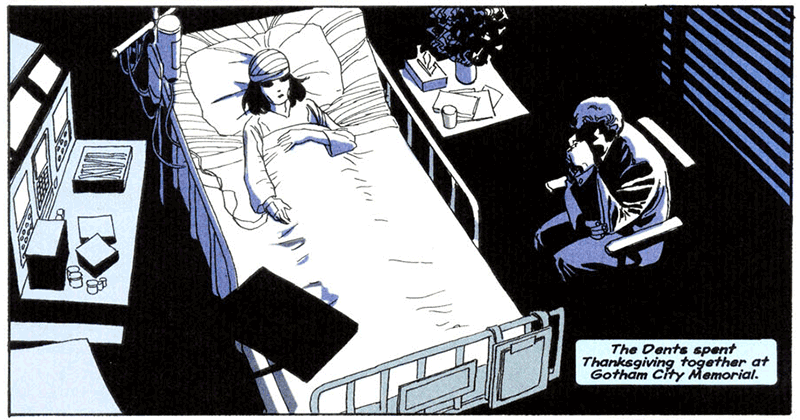 What can I say...I like quiet moments, both in comics and in movies. Sometimes, the world is just too noisy for me. Let's enjoy some quiet moments, shall we? 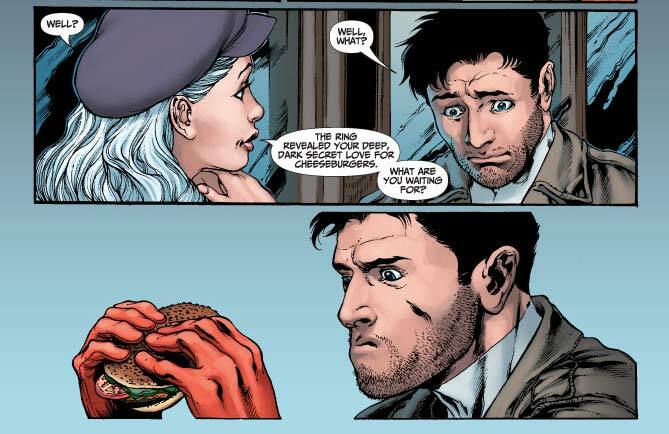 Deadman enjoys a cheeseburger in Brightest Day #7. And bonus: Dove is wearing a hat! I like seeing characters do normal things. I mean, they've got to take a break to eat sometime, right? Plus, that White Ring has a real sense of humor. A pre-Two-Face Harvey Dent watches over his wife in The Long Halloween. I love the muted colors. Oddly enough, do you know what drew my eye in this scene? The tissue box on the tray table. A simple little detail that makes so much sense. When things make sense, I'm happy. A human J'onn J'onzz, in the midst of investigating some "American Secrets" catches some much needed Zzz's. Probably my favorite understated panel of the three. I remember the first time I read Martian Manhunter: American Secrets and this panel stood out at me. Why? Well, for one, the pose is so natural that it's obvious that penciller/inker Eduardo Barreto has a gift for watching people. Secondly, there's such a calmness to this moment, which in contrast to the consistent tension throughout the book, is like coming up for air after being held under water for a long time. Since the book employed first-person narration, it's a lot nicer to have the narration scenes overlaid upon moments of quiet rather than on an action scene, where the effect of a film noir voiceover is lost. And besides, who hasn't taken a nap on the couch and had to cover your eyes like that because of some stray light? So....enjoy the quiet, while it lasts. I like to see the heroes do regular things as well, it's a simple but effective narrative device to make us identify with them and bring our worlds closer together. As a kid I always loved it when I saw a scene of Superboy as Clark Kent simply reading a book or something. Or wen the X-Men were taking a break to play a baseball game (back before they became insanely over-x-posed). Eyz, I still have yet to see Transformers, but they look like sensory overload. In a fun way, though. :) I haven't seen Predators, either! I'm lacking in certain areas of sci-fi viewership. Aaron, it seems like the regular things stand out to me more than the fantastic ones. Maybe because they're relatable. And for reality's sake, superheroes need to have normal lives. They've got to pay the bills somehow. Baseball--that reminds me--remember those Silver Age stories where superheroes would play baseball against villains? I do like the quiet moments. It simply becomes TOO much if all they are doing is epic battle after epic battle without a letup. That's one of the reasons that I liked the old JLI so much. They fought some pretty heavy hitters, but the things that people remember, is J'onn with his chocos, Beetle and Booster's scheming, and Guy and Ice flirting. It was a better film, the way it was directed/constructed.